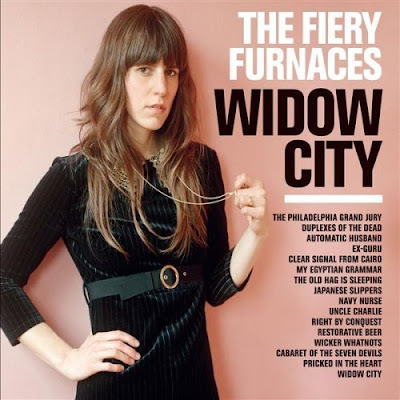 It’s not easy explaining why I enjoy “Ex-Guru” by The Fiery Furnaces, but this standout track by the brother-sister duo of Matthew and Eleanor Friedberger has nonetheless become my favorite of their work so far. It appears on the band’s sixth album, Widow City, and it appears today as my song of the week. Don’t expect its mysteries to be solved by reading the lyrics. Typical for a Furnaces song, the words make vague references to unusual topics that probably wouldn’t make much more sense if referenced directly. Overall, it’s an eclectic mix. (Perhaps just referencing Zues and the DoubleTree in the same song won me over from the get-go. And I have no idea what painting platforms puce has to do with anything.) On paper, the three-line verses seem like they try to cram in way too may syllables, but somehow being sung by Eleanor makes them sound okay. When she thinks of my betrayal? The lyrics alone can’t give much indication of the song’s goodness, which for me stems in large part from the trashy musical interlude after the third verse and the catchiness of the chorus. The interlude — a brief few seconds of cacophony that perhaps get more to the character of the ex-guru herself than any of the words in the song get — presumably represents the ex-guru’s anger and she kicks up that aforementioned thunderstorm. It adds another element to a song that already has a lot going on. When I hear it, I can almost picture the title character raging and fuming on the mesa she apparently owns. (Gurus own mesas?) And this mental image is remarkable, I think, because I otherwise know little about the woman this song is about, save for that she has blonde hair. Notably, David Byrne’s cover of the song adds a few more lyrics in before the trashy part, which itself is shorter and quieter. The end result: not as great of a payoff as in the original. As for the catchiness of the chorus, I could see some Furnaces diehards arguing that it makes the song sound too poppy and therefore out-of-character for the band. This is true, I guess. The chorus is pretty damn poppy, but I feel like this quality is tempered by the verses’ unusual length and bizarre content enough that “Ex-Guru” never had a chance of becoming a radio hit. The video for “Ex-Guru” disappointed me, but it’s the simplest way to let you all hear the song, so here we go. Appropriately strange, I’ll admit, but not in the way I was expecting. And the montage of tree faces during the trashy part disturb me in ways that will likely prevent me from walking through the park all next week. If any of this all sounds even remotely appealing, then you can buy your own version of “Ex-Guru” — sans horrifying tree faces — at Amazon.com or iTunes. "They went through my trash in the middle of the night / I thought it was two raccoons and the neighbor's dog having a fight / I knew it was her when I saw her eyes in the flashlight"
The still/default image for the video looks like poop. Anonymous: Sadly, you're right. Ew.